“Más temprano que tarde vamos a capturar el helicóptero y a los que han realizado este ataque terrorista”, señaló el presidente Nicolás Maduro. Un militar venezolano, funcionario de la Brigada de Acciones Especiales y al que medios del país vecino identifican como Óscar Pérez, sobrevoló este martes la sede del Tribunal Superior de Justicia, TSJ, en Caracas, y desde la aeronave lanzó dos granadas de fragmentación contra el edificio. Antes de tomar el helicóptero, de acuerdo con medios locales, el uniformado dejó un mensaje en Twitter en el que menciona: “Somos nacionalistas, patriotas e institucionalistas. Este combate no es con el resto de las fuerzas del Estado, es en contra de la tiranía de este gobierno”. Después se publicaron varios videos donde se ve el helicóptero sobrevolando la sede del Tribunal Supremo de Justicia mientras se escuchan fuertes explosiones. ÚLTIMA HORA | VIDEO – El momento en que un helicóptero sobrevuela el TSJ este #27Jun y se escuchan detonaciones. Por su parte, el presidente venezolano, Nicolás Maduro, denunció que desde el helicóptero policial se lanzaron dos granadas contra la sede del máximo tribunal de justicia en Caracas, lo que consideró un “ataque terrorista”. “La Fuerza Armada toda la he activado para defender la tranquilidad. Más temprano que tarde vamos a capturar el helicóptero y a los que han realizado este ataque terrorista”, señaló el mandatario en el palacio presidencial de Miraflores. Durante un acto de premiación por el Día del Periodista, Maduro reveló que el helicóptero que atacó el Tribunal Supremo de Justicia (TSJ) pertenece a la policía científica venezolana. “Había en el TSJ una actividad social, podían haber ocasionado una tragedia. Dispararon contra el TSJ y luego sobrevolaron el Ministerio de Interior y Justicia. Este es el tipo de escalada armada que yo he venido denunciando”, dijo Maduro, quien no reportó heridos y confirmó que una de las granadas no explotó. El presidente aseguró que la aeronave era conducida por un hombre que fue piloto de su ex ministro de Interior y Justicia, Miguel Rodríguez Torres, general retirado que se ha distanciado del gobierno, a quien Maduro vincula con un supuesto plan de golpe de Estado en su contra. Durante el acto, el ministro de Comunicación, Ernesto Villegas, afirmó que la aeronave era pilotada por un “individuo que se alzó en armas contra la República”. En las redes sociales circularon fotos del helicóptero sobrevolando Caracas con un cartel que decía “350 Libertad”, en referencia al artículo constitucional que establece el desconocimiento de gobiernos que contraríen las garantías democráticas. Maduro enfrenta desde el 1 de abril una ola de protestas de opositores que exigen su salida del poder, y que ya deja 76 muertos. The cellphone video is vivid. A border patrol agent aims his gun at an unarmed 15-year-old some 60 feet away, across the border with Mexico, and shoots him dead. On Tuesday, the U.S. Supreme Court hears arguments in a case testing whether the family of the dead boy can sue the agent for damages in the U.S. Between 2005 and 2013, there were 42 such cross-border shootings, a dramatic increase over earlier times. The shooting took place on the border between El Paso, Texas, and Juárez, Mexico. The area is about 180 feet across. Eighty feet one way leads to a steep incline and an 18-foot fence on the U.S. side — part of the so-called border wall that has already been built. An almost equal distance the other way is another steep incline leading to a wall topped by a guardrail on the Mexican side. In between is a the dry bed of the Rio Grande with an invisible line in the middle that separates the U.S. and Mexico. Overhead is a railroad bridge with huge columns supporting it, connecting the two countries. In June 2010, Sergio Hernández and his friends were playing chicken, daring each other to run up the incline on the U.S. side and touch the fence, according briefs filed by lawyers for the Hernández family. At some point U.S. border agent Jesus Mesa, patrolling the culvert, arrived on a bicycle, grabbed one of the kids at the fence on the U.S. side, and the others scampered away. Fifteen-year-old Sergio ran past Mesa and hid behind a pillar beneath the bridge on the Mexican side. As the boy peeked out, Agent Mesa, 60 feet or so away on the U.S. side, drew his gun, aimed it at the boy, and fired three times, the last shot hitting the boy in the head. Although agents quickly swarmed the scene, they are forbidden to cross the border. They did not offer medical aid, and soon left on their bikes, according to lawyers for the family. Two days later, cell phone videos surfaced contradicting that account. In one video the boy’s small figure can be seen edging out from behind the column; Mesa fires, and the boy falls to the ground. “The statement literally says he was surrounded by these boys, which is just objectively false,” says Bob Hilliard, who represents the family. Pointing to the cell phone video, he says it is “clear that nobody was near ” agent Mesa. In one video, a woman’s voice is heard saying that some of the boys had been throwing rocks, but the video does not show that, and by the time the shooting takes place, nobody is surrounding agent Mesa. The U.S. Department of Justice decided not to prosecute Mesa. Among other things, the department concluded that it did not have jurisdiction because the boy was not on U.S. soil when he was killed. Mexico charged the agent with murder, but when the U.S. refused to extradite him, no prosecution could go forward. U.S. Customs and Border Patrol did not discipline agent Mesa—a fact that critics, including high-ranking former agency officials, say reflects a pattern inside the agency. The parents of the slain boy, however, have sued Mesa for damages, contending that the killing violated the U.S. Constitution by depriving Sergio Hernández of his life. “I can’t believe that this is allowed to happen – that a border patrol agent is allowed to kill someone on the Mexican side, and nothing happens,” Sergio’s mother, Maria Guadalupe Güereca Betancour, says through an interpreter. As the case comes to the Supreme Court, there has been no trial yet and no court finding of facts. Mesa continues to maintain that he shot the boy in self-defense after being surrounded by rock-throwing kids. That’s a scenario that Mesa’s lawyers say is borne out by other videos from stationary cameras that have not been released to the public. The only question before the Supreme Court centers on whether the Hernández family has the right to sue. A divided panel of the Fifth Circuit Court of Appeals concluded that no reasonable officer would have done what Agent Mesa did, and that therefore the family could sue. However, the full court of appeals reversed that judgment, ruling that because the Hernández boy was standing on the Mexico side of the border and was a Mexican citizen with no ties to the United States, his family could not sue for a violation of the U.S. Constitution. Moreover, the appeals court said that even if the facts as alleged by the Hernández family are true, Mesa is entitled to qualified immunity, meaning he cannot be sued because there is no clearly established body of law barring his conduct. Lawyers for the Hernández family counter that Supreme Court precedents establish a practical approach in determining whether there is a right to sue for the use of excessive force in circumstances like these. Lawyer Hilliard says yes, the boy was across the border when the shots were fired, but by just 60 feet. Hilliard argues that if you follow the border patrol’s argument to its necessary conclusion, “it means that a law enforcement officer is immune to the Constitution when exercising deadly force across the border. “He could stand on the border and target practice with the kids inside the culvert,” Hilliard warns. But lawyer Ortega replies that’s not true, and asks how the court should draw the line. Backed by the federal government, he suggests that a ruling in favor of the Hernández family would mean foreigners could sue over a drone attack. Now it’s up to the Supreme Court to decide where to draw the line. President Trump’s executive order closing the nation’s borders to refugees was put into immediate effect on Friday night. Refugees who were airborne on flights on the way to the United States when the order was signed were stopped and detained at airports. The detentions prompted legal challenges as lawyers representing two Iraqis held at Kennedy Airport filed a writ of habeas corpus early Saturday in the Eastern District of New York seeking to have their clients released. At the same time, they filed a motion for class certification, in an effort to represent all refugees and immigrants who they said were being unlawfully detained at ports of entry. Mr. Trump’s order, which suspends entry for all refugees for 120 days, created a legal limbo for people on their way to the United States and panic for families who were awaiting their arrival. The president’s order also blocks the admission of refugees from Syria indefinitely, and bars entry into the United States for 90 days from seven predominantly Muslim countries linked to concerns about terrorism. Those countries are Iran, Iraq, Libya, Somalia, Sudan, Syria and Yemen. It was unclear how many refugees and immigrants were being held nationwide in the aftermath of the executive order. The complaints were filed by a prominent group including the American Civil Liberties Union, the International Refugee Assistance Project at the Urban Justice Center, the National Immigration Law Center, Yale Law School’s Jerome N. Frank Legal Services Organization and the firm Kilpatrick Townsend & Stockton. The lawyers said that one of the Iraqis detained at Kennedy Airport, Hameed Khalid Darweesh, had worked on behalf of the United States government in Iraq for 10 years. The other, Haider Sameer Abdulkhaleq Alshawi, was coming to the United States to join his wife, who had worked for an American contractor, and young son, the lawyers said. They said both men had been detained at the airport on Friday night after arriving on separate flights. The lawyers said they had not been allowed to meet with their clients, and there were tense moments as they tried to reach them. “Who is the person we need to talk to?” asked one of the lawyers, Mark Doss, a supervising attorney at the International Refugee Assistance Project. The executive order, which Mr. Trump said was part of an extreme vetting plan to keep out “radical Islamic terrorists,” also established a religious test for refugees from Muslim nations: He ordered that Christians and others from minority religions be granted priority over Muslims. In the arrivals hall at Terminal 4 of Kennedy Airport, Mr. Doss and two other lawyers fought fatigue as they tried to learn the status of their clients on the other side of the security perimeter. “These are people with valid visas and legitimate refugee claims who have already been determined by the State Department and the Department of Homeland Security to be admissible and to be allowed to enter the U.S. and now are being unlawfully detained,” Mr. Doss said. A supervisor for Customs and Border Protection at Kennedy Airport declined to comment, referring questions to public affairs officials. Calls to officials in Washington and New York were not returned early Saturday. According to the filing, Mr. Darweesh was granted a special immigrant visa on Jan. 20, the same day Mr. Trump was sworn in as president. Mr. Darweesh worked with the United States in Iraq in a variety of jobs — as an interpreter, engineer and contractor — over the course of roughly a decade. Mr. Darweesh worked as an interpreter for the Army’s 101st Airborne Division in Baghdad and Mosul starting shortly after the invasion of Iraq on April 1, 2003. The filing said he had been directly targeted twice for working with the United States military. A husband and father of three, he arrived at Kennedy Airport on Friday evening with his family. Mr. Darweesh’s wife and children made it through passport control and customs, but agents of Customs and Border Protection stopped and detained him. “He is a brave individual, and he cares about Iraq and he cares about the U.S.,” he said of Mr. Darweesh. Mr. Alshawi was supposed to be reunited with his wife, who has been living in Texas. The wife, who asked to be identified by her first initial, D., out of concern for her family’s safety, wiped away tears as she sat on a couch in her sister’s house early Saturday in a Houston suburb. The woman, a 32-year-old who was born in Iraq, met her husband when both were students at a Baghdad college. The couple has one child, a 7-year-old son who is in first grade. The boy was asleep in the house at 3 a.m. Eastern time Saturday, unaware that his father was in the United States but under detention and at risk of being returned to Iraq. Relatives crowded the living room in their pajamas and slippers, making and receiving phone calls to and from other relatives and the refugee’s lawyers. At times, D. was so emotional that she had trouble speaking about her husband’s predicament. She pulled out her cellphone and flipped through her pictures. She wanted to show a reporter a picture she had taken of her son’s letter to Santa Claus. In November, at a Macy’s Santa-letter display at a nearby mall, the boy wrote out his wish: “Dear Santa: Can you bring my Dad from Sweden pls.” He has not seen his father in three years. She and her relatives had not told her son that his father was finally coming to Houston and that the son’s wish to Santa was about to come true. “It was a surprise for him,” she said. Earlier on Friday, she had watched news coverage about Mr. Trump’s executive order. “My husband was already on the airplane,” she said. “He got to the airplane at 11 o’clock in Houston time.” At that point, she grew worried about what effect the order would have on her husband, but she assumed it would not take effect immediately. D., along with her brother and her sister, asked that their full names not be used because they were concerned that publicity about the case would lead to harassment. At about 2:30 a.m. Eastern time Saturday, Mr. Alshawi called his wife on her cellphone. They spoke for about five minutes, and D. put the call on speaker so the rest of the family gathered at the house could hear. It was the first time D. and her husband had spoken since he arrived at the airport in New York at about 8:30 p.m. Eastern time on Friday, she said. He had flown from Stockholm to New York, and was supposed to then fly to Houston. She said the authorities at the airport had told him that the president’s signing of the executive order was the reason he could not proceed to Houston. “They told him it’s the president’s decision,” she said. D.’s brother added of the phone call with his brother-in-law, “He’s very calm but he’s desperate. He said, ‘They are sending me there, they are sending me there,’” referring to Iraq. 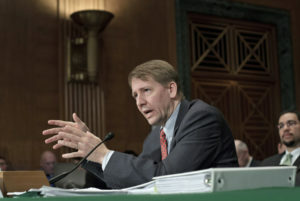 Consumer Financial Protection Bureau Director Richard Cordray testifies on Capitol Hill in January. A federal appeals court ruled on Tuesday that the U.S. Consumer Financial Protection Bureau was unconstitutionally structured by Congress. The U.S. Court of Appeals for the District of Columbia Circuit decided that an independent agency should not be run by a single individual. The CFPB, U.S. Circuit Judge Brett Kavanaugh wrote, was structured differently from other agencies. In the past, government agencies run by a single person — like the Department of Justice, for example — were always overseen by the president and the president could fire the directors at will. Independent agencies, like the Federal Communications Commission and the National Labor Relations Board, have been run by a group of people, who can only be removed by the president for cause. The CFPB was structured by the Dodd-Frank Act of 2010 to be run by a single person, who could only be removed by the president for cause. “The CFPB’s concentration of enormous executive power in a single, unaccountable, unchecked Director not only departs from settled historical practice, but also poses a far greater risk of arbitrary decision-making and abuse of power, and a far greater threat to individual liberty, than does a multi-member independent agency,” Kavanaugh wrote. The petitioner in the case, PHH Corp., a mortgage lender, had asked the court to do away with the CFPB entirely and let Congress restructure the agency to meet the checks-and-balances demands of the Constitution. The court took a more narrow route. It struck the “for cause” provision of the law, which now means the CFPB is structured the way other single-leader agencies, like the Justice Department, are. In other words, the president can now remove the agency head at will. In a separate part of the decision, the appeals court also decided to throw out the CFPB’s $109 million order against PHH. The court said CFPB had acted, at least in part, outside the statute of limitations.